We found this turtle walking the streets in our town. We have no idea where he came from but from the looks of it he seems to be pretty old. We contacted animal shelter to see if they could come get him and place him somewhere safer than one block from a major street and they were closed so we called the police and they wouldn't do anything at all. What if any info can you give me about this big boy. Call a zoo they will know how to care for him hes super cute..poor baby.. Even if you have to have him shipped to another state into a zoo who can care for him long term..
Or keep putting out those found Tortoise signs,adds,keep him safe from predators, dogs,or people trying to take him.hes awsome. I have two Sulcata tortoises around 10 years of age, and they look exactly like that. They eat romaine lettuce, alfalfa hay, and occasionally strawberries and carrots. 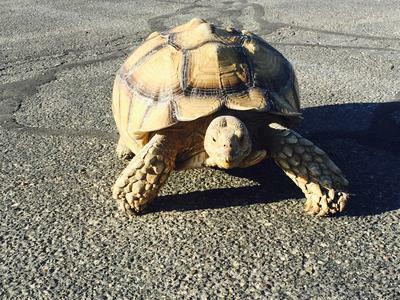 Please put up "lost tortoise" posters asap and contact local shelters- they can be difficult to take care of if you don't have enough money. It's possible it's a release from someone irresponsible who simply didn't want it anymore. :( However, I'm not exactly sure how you'd go about releasing one of those big tortoises... you'd likely be seen. Good luck finding the owner! Hi, I just wanted to add to my comments of yesterday in case you are still caring for Big Boy to anyone reading. I feel responsible writing my thoughts on care because I too am no expert on tortoise care and have learned much of what I know the really hard way with tortoise illnesses so my comments are to be taken in a general average care way. I have been caring for a Sulcata for 10 years and much of the info out there then has changed now. For instance, I now know that tortoises need a fine balance of the right food mostly grasses and enough water/humidity (humidity in recent years has been found to be important but has to be correctly done with temperature levels for both ambient and basking spot correct when inside and air temperature and sunlight outside. They do need water access daily, soaking 1or 2 times weekly and accompanied with the correct ambient temperatures and excersize. ( I believe all this to be true but check with your vet). They require room to roam and the correct environment to protect against object and plants that are poisonous. Tortoises are prone to bladder stones too which can be caused in part by the wrong diet including too many vegetables and a lack of enough water causing dehydration. So in short, Do much research and most importantly find a great Vet preferably a Herpatologist and see him/her at least 2 x a year. I have had a lot of trails and many errors. Including a case of pneumonia. So while experience from others is helpful, a specialist is best. Big a Boy depending on the weather in your area should only be outside if temps are in the upper 60's or above. These tortoises eat various grasses as their main diet (herbivores) and not excessive amounts of watery vegetables and fruit as the sugars and watery veggies can be harmful to their digestive tracts, even though they will aggressively eat them. They do not hibernate which means they eat all year round, and may slow down with lower temperatures, but do not sleep through the winter and should be brought inside during cold or rainy/humid days and nights. They need a place of dry shelter when housed outside too. This allows escape from the rain or hot sun. Even then, if the weather/air is too humid or too cold they should be brought inside. They need access to water at all times for drinking/occasionally soaking in. When inside they need proper UV lighting and a heat lamp in an area that they can move under and also get away from that is positioned at the right height and temperature. Do research on African Sulcata spur thighed tortoises. They can be tricky to care for and keep healthy but robust when done properly. Signs of illness can include watery eyes and bubbly nose/mouth and/or open mouth breathing both of which require a Vet visit and possible antibiotics. Melissa Kaplan has a great website. Be careful about what you believe on many web sites and from various care givers as there is a lot of misinformation about care needs out there. He/she looks like a Sulcata Tortoise, depending on care the first 10 years, this could be a fairly young tortoise, if well cared for a 10 year old can be around 70-90 lbs, looking old really isn't an indication of age, because tortoises are resilient, when not well cared for, they tend to bare the scars of the hardship they bare. Depending on where you live he may not be able to survive on his own, and the burrowing habits of the tortoise, make it common for escape hopefully the case and not an intentionally dumped off, if you have a backyard and live in one of the lower southern states. Unfortunately many of these tortoises get abandoned because they were cute when they were the size of a tennis ball, and I've seen them during certain times of the season, can be obtained for as little as $50. And people don't realize that a female will grow to nearly 100 pounds and a male tops off in the 200 pounds range.